With water filling the dugouts and lapping at the feet of spectators in the box seats, the Cardinals and Reds raced to complete a game at Cincinnati before flooding made conditions unplayable. Completing nine innings in 1:56, the Reds beat the Cardinals, 6-1, on April 22, 1940, at Crosley Field. The night before, the Ohio River reached the 55-foot stage. Reds officials knew Crosley Field, located near Mill Creek, started flooding when the river got to 57 feet, or five feet above normal flood stage, International News Service reported. It was expected the river stage would reach 57 feet in late afternoon or early evening on April 22. The Reds moved up the starting time of their game with the Cardinals that afternoon by an hour, from 3 p.m. to 2 p.m.
At game time, however, water stood a foot deep in both dugouts _ even deeper in nearby parking lots _ and a crowd of 5,197 “had to puddle-jump their way into the park,” the Associated Press reported. Patrons seated in field-level box seats behind third base “pulled their feet higher and higher” as the game progressed and water continued to rise. The players sat on benches in foul territory because the water in the dugouts eventually reached three feet deep, according to the book “Cardinals Journal” by John Snyder. The game matched starting pitchers Bucky Walters, a 27-game winner in 1939 when he earned the National League Most Valuable Player Award, for the Reds against Bill McGee. Cincinnati, the defending National League champions, broke a scoreless tie with three runs in the fifth against McGee. The Reds added three more in the seventh off Clyde Shoun. The Cardinals were supposed to play the Reds again on April 23 and April 24, but both games were postponed. 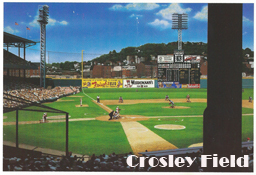 By then, the Ohio River had reached 58 feet and water covered the Crosley Field outfield. Another foot would put home plate under water.